Operating the AVTE-8010 is extremely simple. The operator merely has to place a tray of cards onto the drawer extending from the system's front panel. Pushing the Start button causes the drawer to retract and lower, setting the devices in the tray in contact with the pogo pins of the AVTE-8010's test and programming head. The system can be configured for a variety of devices by means of swapping out the matching load and tray kits. This changeover process takes all of a few minutes at most! 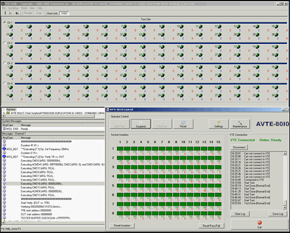 The AVTE-8010 offers the highest throughput in testing and programming Flash memory devices of any system of similar size on the market. The system can process thousands of devices per hour; far more than any other desktop system available. For example: the AVTE-8010 can program and verify 2,400+ uSD cards with 10MB/s read/write speeds per hr. In addition, the indexing time is also miniscule, as replacing a test and programming tray and feeding it to the system's load boards takes all of 10 seconds maximum. The AVTE-8010 is capable of testing all current and future memory card and storage devices including UHS-SD cards (104-208MHz).